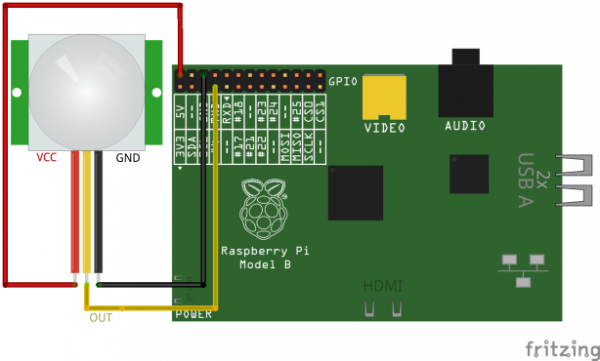 Raspberry Pi: Vocal Intruder Warning System « Adafruit Industries – Makers, hackers, artists, designers and engineers! class think has a fun project idea for building a vocal intruder warning system. Thanks to the GPIO pins on the Raspberry Pi, you can attach a lot of external sensors. One such sensor that is excellent for learning with is a Passive Infra Red detector (or PIR). A PIR detects the heat given off from living beings (people, pets etc). They are normally used to open doors and turn on lights, but what I am going to show you is how you can use a simple £3 module attached to a Raspberry PI and create a fun room entry warning system that will use text to speech to say a warning out loud.